This article is taken from an email sent by my friend Caleb Maupin from the Iranian Red Crescent Ship on it’s way to Yemen with medical aid and food for the people. My name is Caleb Maupin, and I am a radical journalist and political analyst. I am also an anti-war activist working with the International Action Center, Fight Imperialism Stand Together (FIST), and the United National Anti-War Committee. I am 27 years old and I grew up in Ohio. I currently live in Brooklyn, New York with my loving spouse Meches. However, as you receive this message I am thousands of miles away from home, on a ship in the Persian Gulf. Why am I out at sea on the other side of the world? I am part of a humanitarian mission being carried out by the Red Crescent Society of the Islamic Republic of Iran. We are attempting to bring medical supplies, flour, and water to the people of Yemen. In response to a massive uprising demanding democracy and self-determination in Yemen, the Kingdom of Saudi Arabia has unleashed a horrific bombing campaign. Over one thousand innocent civilians are already dead. Schools, hospitals, power plants and mosques are being targeted. As a citizen of the United States, nothing disturbs me more than the fact that the cruise missiles and other weapons being used to terrorize and kill innocent Yemenis, are provided by my own government. Our government constantly utilizes propaganda about “Human Rights” when attempting to isolate and demonize certain countries, but for more than half a century it has been coddling the Kingdom of Saudi Arabia, one of the most blatant human rights violators on the planet. The Saudi regime not only beheads, tortures, and exploits people within its own borders, but it represses people throughout the region. The people of Yemen have long been held down by a corrupt un-democratic regime backed and supported by Saudi Arabia and the United States. The recently deposed President Mansour Hadi ran unopposed in the election as the official Saudi backed and selected candidate. The US/Saudi regime in Yemen facilitated a horrific campaign of drone strikes by the US military that has left countless innocent civilians dead. In response to years of impoverishment, repression, and humiliation, the people of Yemen have risen up in revolution. The Ansarullah organization, commonly called the “Houthis” in US media, is at the center of a broad coalition of forces that is writing a new constitution. Popular Committees have sprung up all across the country. Despite what you have heard on CNN, this is not an ethnic or religious war. This is not a “proxy war” with Iran. This is a popular, anti-imperialist struggle for democracy and independence led by the Yemeni people themselves. The Ansarullah organization is aligned with Sunnis, secularists, and various forces from across Yemeni society who want to free their country from foreign hands. In response to this massive upsurge of people’s power, the Kingdom of Saudi Arabia, along with ISIS and Al-Queda in Yemen, are waging a campaign of violent terrorism. They hope to drown this popular revolution in blood, beat down the Yemeni people, and force them back under their dominion. The US government is supporting the Saudi regime and its allies in their criminal attack. This is abhorrent and immoral. A few passing words of criticism and condemnation from US officials do not change the reality of the ugly US alliance with the Saudi regime. The US officials who arm and coddle the Saudi regime, as well as the US and British oil corporations who make billions of dollars from this twisted relationship, are complicit in the crimes against humanity which are currently taking place in Yemen. The Yemeni people, despite this horrendous bombing campaign, have not surrendered. The Ansarullah fighters have aligned with the Yemeni Army and the Tribal Forces in a united front. Saudi Arabia’s attempt to form a “Free Army” of Yemeni mercenaries has completely flopped. It is now being reported that more than 642,000 Yemenis of various religious backgrounds have joined together to form People’s Militias to beat back the Saudi assault. On board the Rescue Ship with me are other peace activists from the US, Germany, and France, as well as many doctors and a few journalists from Iran. We intend to deliver our cargo of over 2,500 tons of food and medical supplies to the port of Hodeidah on the Red Sea. Everything on the ship has been carefully checked to make sure that NOTHING that could be considered a weapon is on board. This is a mission of peace, carried out by the Red Crescent Society of the Islamic Republic of Iran, a non-governmental organization recognized by the United Nations. Iranian jets attempted to deliver medical aid on April 28th. They were cleared for landing by the Yemeni airports, but before they could touch down, they were repelled by Saudi fighter jets. 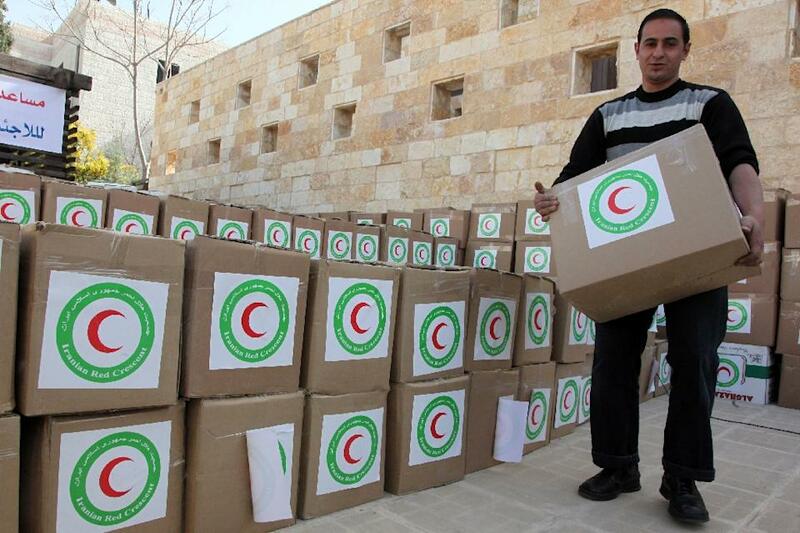 Blocking the delivery of humanitarian aid is an extreme violation of international law. As our craft propels itself through the Persian Gulf, we are loudly urging that no one interfere with this peaceful humanitarian mission. Editor’s note: If you would like to sign a petition asking that the Saudi Prince who as Minister of Defence is responsible for this onslaught be referred to the International Criminal Court (ICC), please click HERE. Thank you so much for publishing this informative report by Caleb Maupin. His passion for justice for the Yemeni people shines through all of his writing. Right now the media are echoing the “concerns” of our government for security issues involved with the Iranian escorted humanitarian aid boats. Let’s just hope that no attempt is made to intercept or block the delivery of much needed humanitarian aid. I’m going to be sharing this article with the senior legislative aide of my Congressional Representative, along with background materials and several petitions calling for the end to US supply and support for the Saudi bombing campaign.